I love trying new things, I love experimenting in the kitchen. Some recipes I love immediately, some I have to tweak a little. This is one I tweaked. 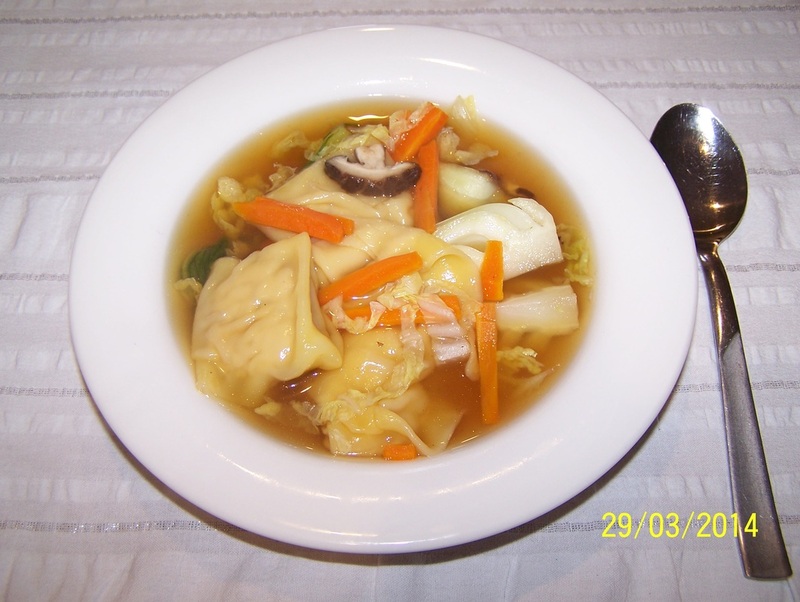 The first time I made this soup, I loved the wontons, they were very flavoursome, but I thought the soup lacked flavour. So then I tried another recipe, but I used the same wonton filling, why change something I thought was great. This time I was happy with the soup as well. So here I have combined two recipes. The first soup had carrots, mushrooms and cabbage, the second soup didn't, but I liked having carrots, mushrooms and cabbage so I added them back in to the second recipe. Wrapping the wontons was easy enough, with this being my first attempt at it, I didn't find it difficult at all (once I figured out how I liked them). 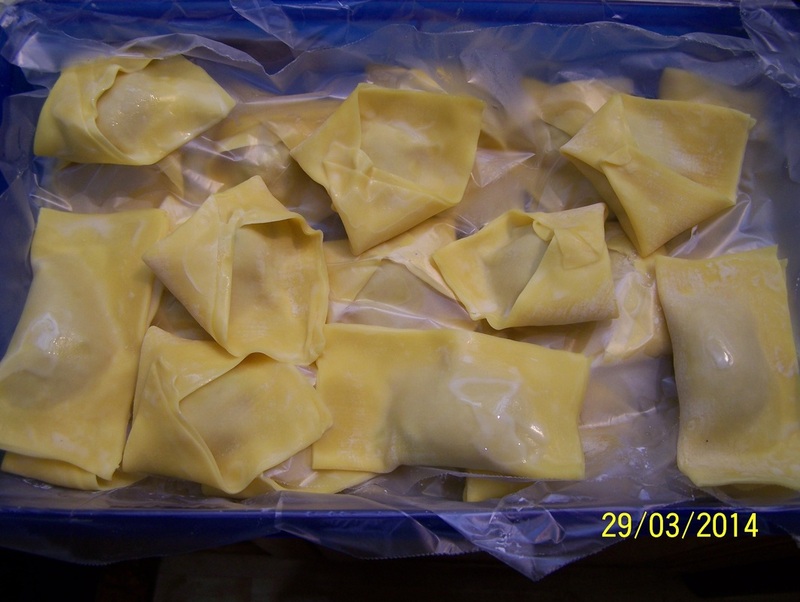 If you have any leftover filling, just freeze it for another time, or with wet hands form mini meatballs, and add it to the soup when adding the wontons, they don't fall apart. My husband would decrease the amount of ginger in the wonton filling, while I loved it, so if you don't like a lot of ginger, simply decrease the amount to suit your tastebuds. As for the Sambal Oelek, this was my first taste of it, so I will mention, if this is your first try, add a small amount, it is really spicy, but do add it, it really adds to the overall flavour of the soup. I also like to break the wontons in my bowl when eating them, as they are large, but more importantly the filling adds even more flavour to the soup when it is broken in the soup. This is a lovely light soup, very fragrant, it was a hit with my family. 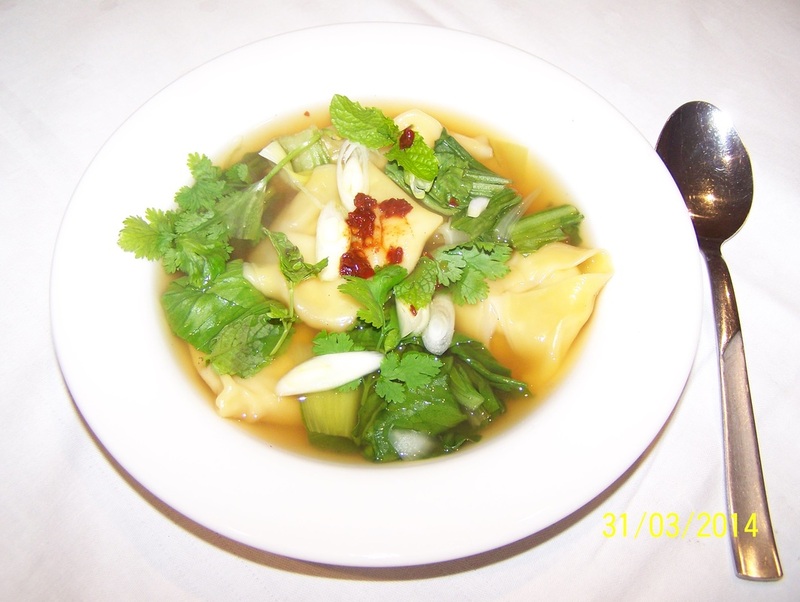 Wontons: Place chicken mince, ginger, garlic, spring onion, water chestnuts, sherry and soy sauce in a bowl. Mix well to combine. Lay a wonton out on a clean surface. Spoon about 1 teaspoon of the mince mixture on one half of the wrapper, leaving a 1cm border. Using your finger, spread a little cold water around the edge of the wonton. Fold wrapper over diagonally to enclose filling and form a triangle. Now from the mince mixture press the wonton toward the edges, making sure there is no air pockets around the mince mixture. If you leave air pockets, the wontons can open during the cooking process. So gently seal the edges from the mince mixture out. Make sure the edges are pressed together to seal. Now lightly moisten with water the two corners of the folded edge. Bring the two corners of the folded edge together and press to seal. You now have a tortellini shape. (You can simply fold in a rectangle shape, as seen below also, but it doesn't look very nice). Place on a baking tray lined with baking paper. Repeat with remaining wrappers and mince mixture. Refrigerate until needed. Place stock, soy sauce, ginger, garlic, cinnamon, star anise and chilli, if using, in a large saucepan over medium-high heat. Cover. Bring to the boil. Reduce the heat to low. Simmer for 10 minutes for flavours to develop. Remove from heat. Strain. Discard ginger, garlic, cinnamon and star anise. Return stock to pan, bring back to a simmer. Separate bok choy leaves from stems. Chop stems into 3 pieces. Roughly chop leaves. Add carrots, bok choy stems and wontons to the stock, simmer, uncovered for 5 minutes. Add the bok choy leaves, mushrooms and cabbage. Cook for 2 minutes or until leaves have wilted and cabbage is tender. Ladle into bowls. Sprinkle over spring onion, coriander and mint. Serve with sambal oelek.